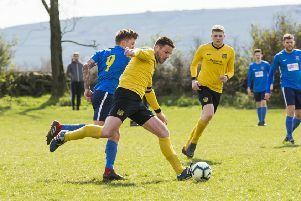 The Premier Division bottom two, Illingworth St Mary’s and Northowram, both picked up three points in the Haslem-Sheppard Halifax AFL on Saturday. Illingworth maintained their recent improvement with a stunning 5-1 win at Greetland while the Rams lifted themselves a place at the expense of their visitors Calder ‘76, who were beaten 4-2. Greetland have lost their way after a painful county cup exit to Golcar at the start of the year and they were no match for a Saints side who had two goals from Luke Prosser. Visiting man of the match Josh Langan, Jon Ashworth and Jack Pullan got the others. Play in the first half on a difficult surface at Northowram Rec was fairly scrappy and occasionally frantic. The hosts, playing down the slope, took the lead after eight minutes when Jake Baker’s free kick took a slight deflection but Calder levelled seven minutes later through Sam Cartwright’s mistimed attempted centre which floated over James Bunn. John Moynes put the visitors in front after 25 minutes when his shot bobbled over Bunn’s dive. Close to half-time Archie Griffiths’ long range free kick eluded everyone and bounced narrowly past the post and a snap shot from Lewis Oldridge flew not far over the top. In complete contrast to what had gone before, the Rams produced a pleasing move of classic simplicity involving five perfect passes culminating in Josh Baines slotting home to level the scores. Moynes fired wide of an open goal from Calder’s best move of the game and the introduction of Rams’ substitute Scott Singleton paid immediate dividends when he put his side ahead from close range following a corner earned through Oldridge’s persistence. Baines missed a glorious chance to extend the lead but Singleton’s superb defence-splitting pass put Oldridge in lots of space 25 yards out and after teasing his marker he beat the keeper at his near post. Baines and Singleton had further chances while there was no lack of endeavour and commitment from Calder, who hooked a shot narrowly wide. Midgley United and Sowerby Bridge remain separated by a point in third and fourth places after a 3-3 draw. Midgley were a shade slow out of the blocks on a heavy pitch but there was little between the sides for 30 minutes. George Bamford’s 16-yard strike, which took a deflection, gave the home side a lead they held until half time. Central midfielder Luke Maguire was a late arrival for Bridge but then impressed. He levelled matters from the penalty spot and got one of Bridge’s other two goals as the visitors put in a strong 20 minutes and went 3-1 up. However, Midgley dug in and struck twice in fairly quick succession entering the final 10 minutes. Greg Spink scored from the penalty spot after Tom Hosker had been pulled down and the equaliser came when a Toby Standring cross was deflected in off a defender. Midgley pressed for a winner and had a few corners but Bridge defended well.